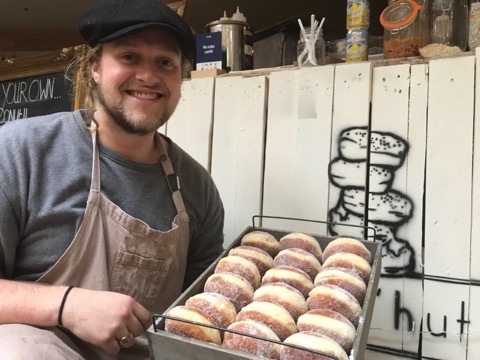 Feast It spoke to the up and coming man in the Leeds artisan donut scene and self professed ‘donut boy’, Tom Stafford, who told us about his great brand, growing success and dangerously delicious donuts. These traditional donuts are handmade fresh every single day using Tom’s very own lovingly created recipe. So here it is… the hole truth about Doh’hut! When did your love of baking and dough begin? I first started experimenting with breads and I loved the kneading process, it’s very soothing stuff. Making something so tasty and full of flavour with such minimal and everyday ingredients was very satisfying. When did you decide to become a donut man? While I was visiting the USA I was very inspired by the street food scene (I ate a lot). One night my friends and I were at a rooftop bar in Denver Colorado circulating the idea of a build your own donut, but a traditional English one, not a ring donut. From that night I committed to starting Doh’hut. Was it hard to take the leap or did you know this was what you wanted to do? No, I think I have found my calling. Donut boy for life! Tell us a little bit about how you created your brand. I just created what I would want to see from a sweet food trader, high quality produce and a touch traditional. Focusing on one item and doing it the best. You're only 24 years old and doing so well, do you consider yourself an entrepreneur? I guess so. I like being my own boss. Do you have a market stall or a truck? I currently have both, and I'm prepping a brand new trailer for the festival season, and I am also looking into a potential residence in a Leeds street food spot. The market stall pops up all over the place. Does your truck have a name? It doesn't have a name yet, I'm open to suggestions. Where and when can you be found? 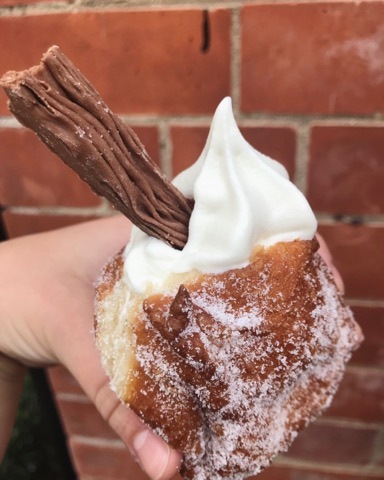 My stall pops up around the Leeds City area, but Instagram is the best to follow me around and get your hands on a donut. What were the first 3 steps of getting yourself setup? Creating a great product. Creating an image. Being passionate about both of the above. What has been the high point of your donut career so far? Generally people loving my product and a little gasp when they see the menu makes me so happy! Have you had any little glitches along the way? Yes, too many glitches. Starting a business is full of ups and downs. Do you ever get bored of donuts? Nope, I'm lucky enough to get the first fresh donut straight from the fryer every morning. I taste the first donut of every batch to ensure it's exactly how I want it. Do you cater for events, like weddings or birthdays? I will do all and any event that comes my way. Do you have people working for you? It's all me at the moment, but my lovely girlfriend Holly helps out a lot. Although, I am looking for a baker apprentice. What's your favourite Doh'hut donut? The Creme Brûlée, it's Creme Pat filled with torched caster sugar on top, giving the top a tasty caramel snap. Do you make lots of donuts for friends and family? I used to make donuts for friends and family all the time, not so much now because I'm really busy, they have to come to events to get treats. What did you do before Doh'hut? Before I started making donuts I was a snowboard instructor in Canada, which I hope to return too at some point in the future. Where do you see your and your donuts in 2 years time? 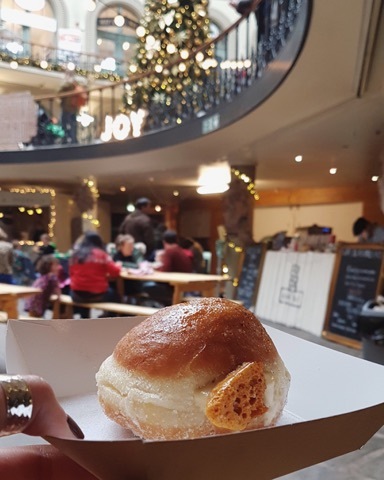 Hopefully I'll have a shop or a bakery, and I would love to have a crack at best dessert at the British street food awards. Book Doh'hut on Feast It today for your next wedding, party or corporate event in the Leeds and Manchester areas! 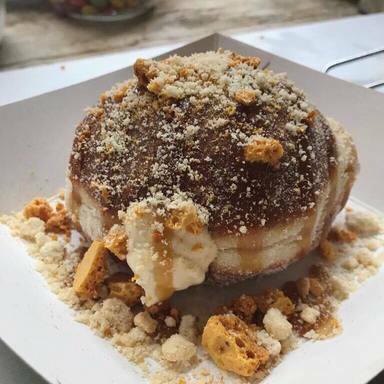 If you can't wait for your party and need to get your hands on one of Tom's fresh donuts, give him a follow on Instagram, Facebook or Twitter to see where he's popping up!